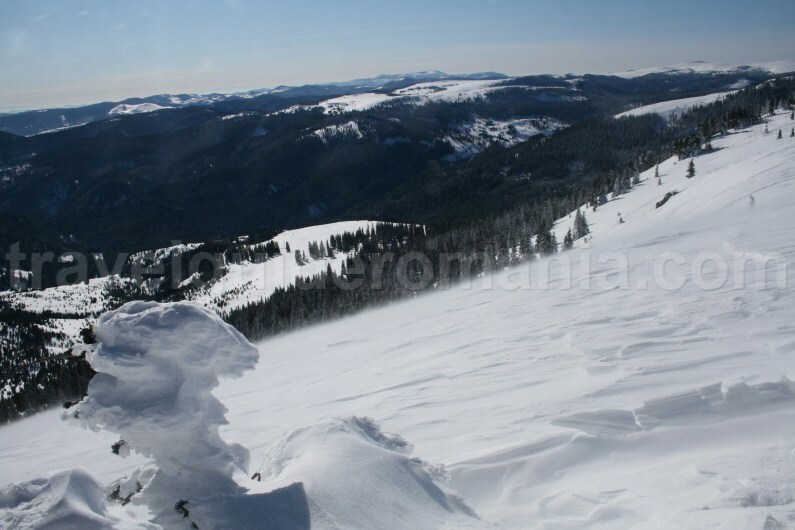 Vlădeasa Peak is the second highest peak in the Apuseni Mountains. 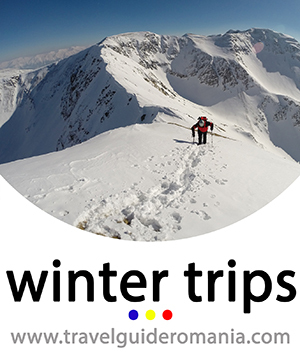 A winter trip on the peak is recommended to be done on touring skies and with snowshoes. Because of the high level of snow, forwarding thourgh snow without these accesssories would be difficult. 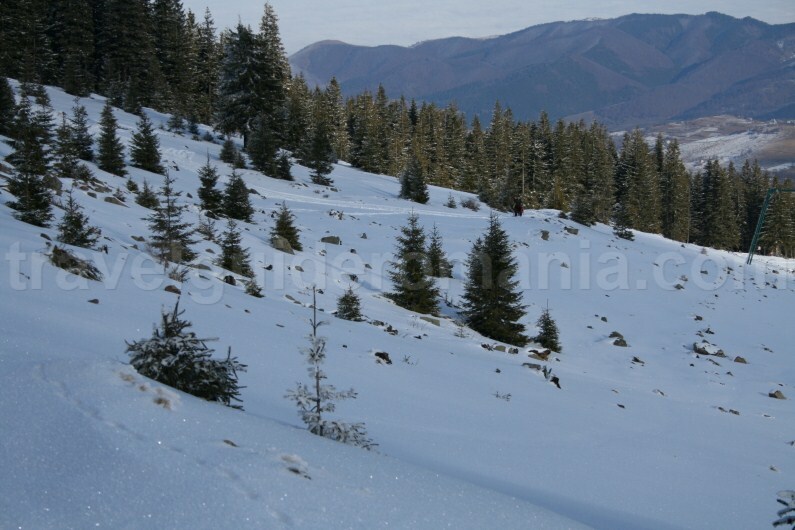 General information: The Vlădeasa Mountains are a sub-region of the Apuseni Mountains. The Vlădeasa massif has the form of a horseshoe a W, having the opening orientated towards north. 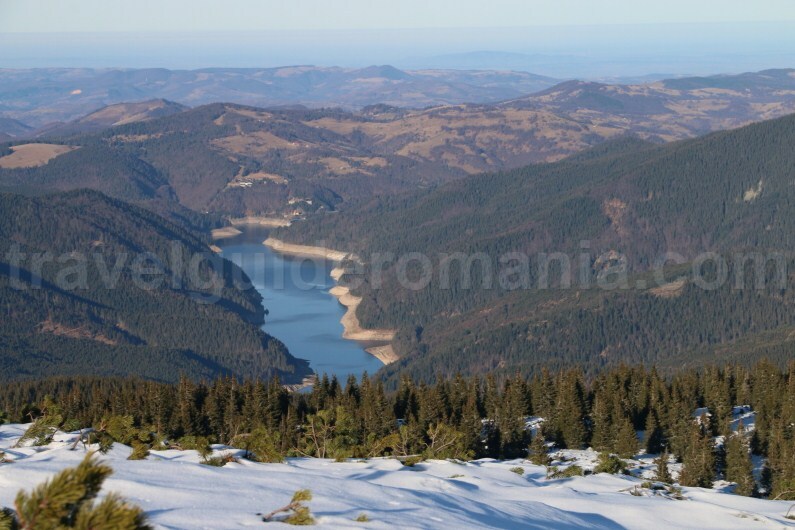 The two inlets are realized by the main waters of the massif: Drăganului Valley on the east and Hell‘s Valley (Valea Iadului) on the west. 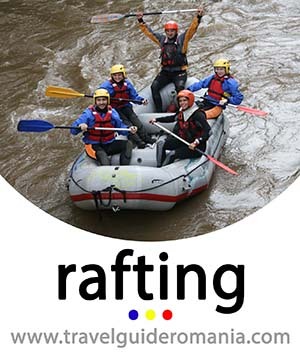 The heights which go around the Drăganului Valley‘s springs are the highest and the largest. 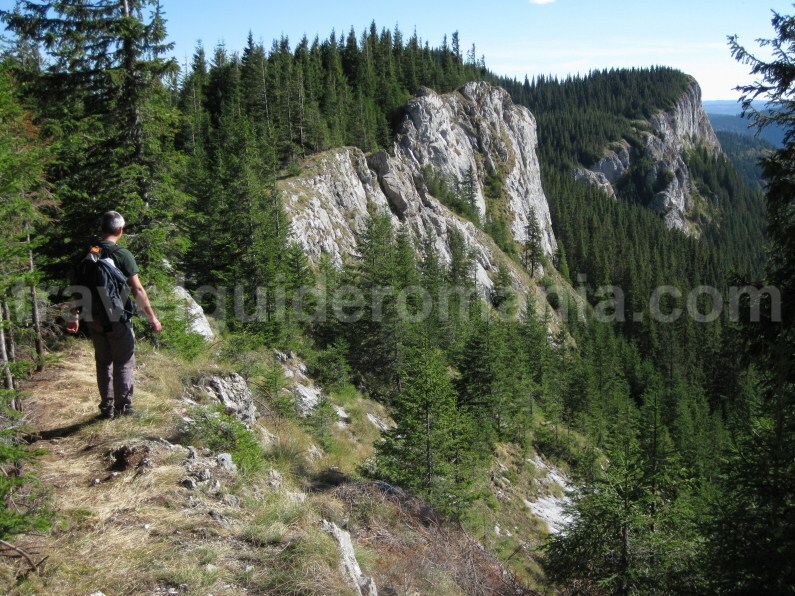 The Vlădeasa Mountains are formed of vulcanic rocks, they have a surface similar to the Biharia Massif: heavy massif forms, having inclined slopes but uniformed. 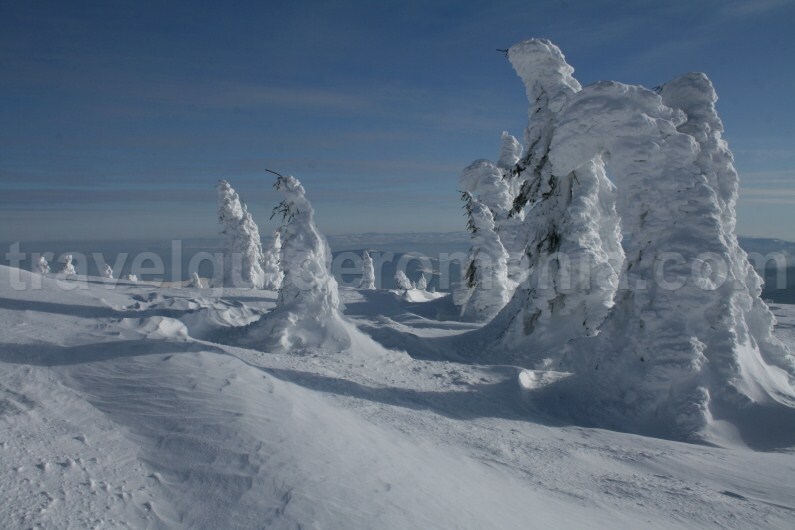 The average height of the heights from the ridge area is 1 600m. In order to reach the Vlădeasa Peak you have more choices: climbing from Rogojel Village on the blue tape marked trail; from Răchițele Fall along White Stones; from Drăganului Valley (along the Devil’s Mill Fall). 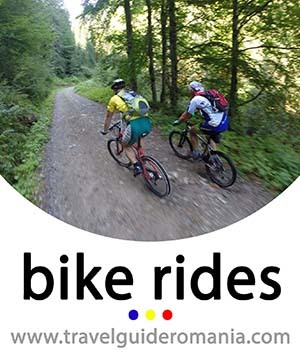 The most accessible trail is the one from the Rogojel Village. 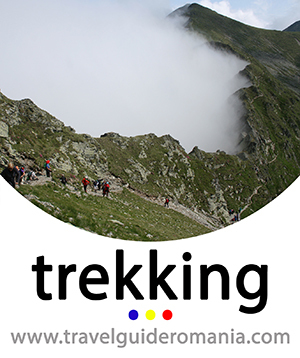 Recommended trail: Rogojel Village – Vlădeasa Chalet – Vlădeasa Peak (1835m) and the meteorological cottage – White Stones – Răchițele Fall – Răchițele Valley – Răchițele Village. The disadvantage or taking this trail is that if you leave the car at in the Rogojel Village you will have to go back to recover it. The distance between the Răchițele Village and the Rogojel is 20km. 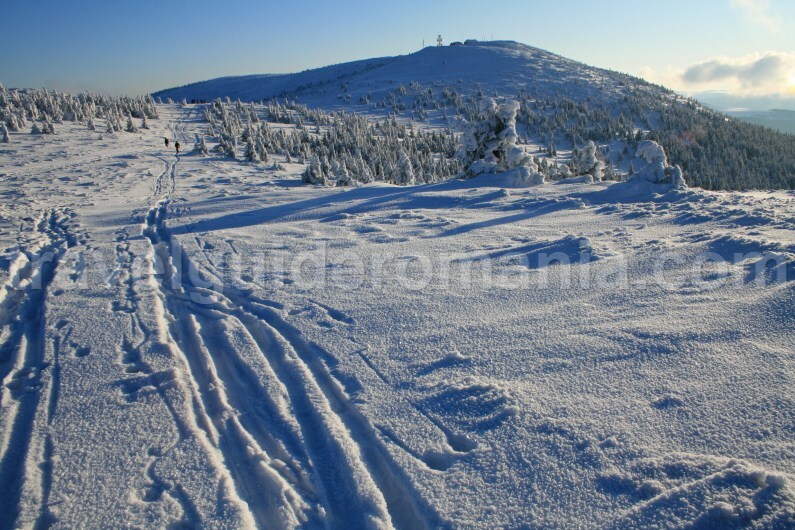 If you want to shorten the trip you can return to the Vlădeasa Peak on the same trail you climb it. 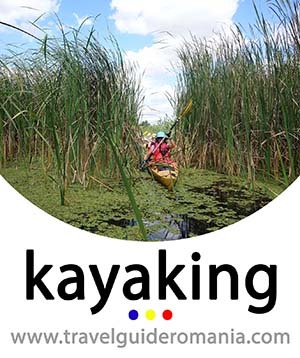 Considering the time you have you can make this trip in a day or two. 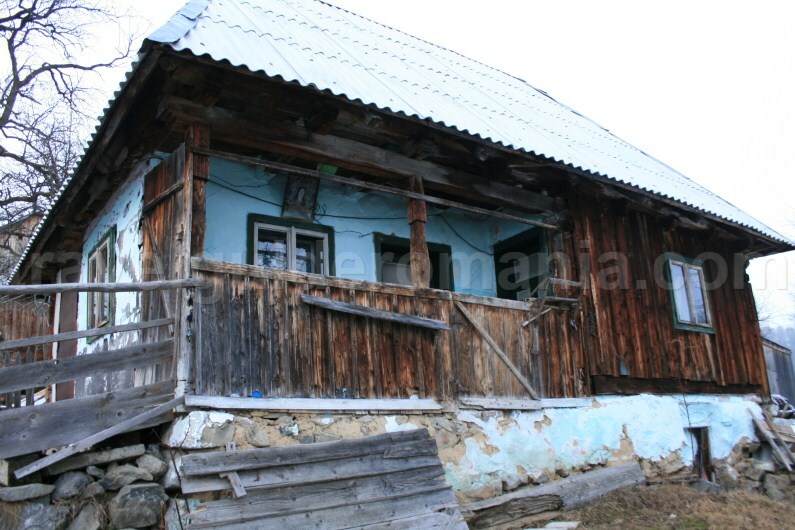 If you choose to spend two days you can sleep at the Vlădeasa chalet. Access: (from Cluj-Napoca or Oradea, on the European road E60 you turn towards the Bologa Village > Săcuieu Village > Rogojel Village. You leave the car beside the village store and continue on the road which takes towards the village. After 500m you will see a trail on the left side of the forward moving direction. You may continue on the road just that you will go around much more. The marking (blue tape) continues through the scattered houses of the Rogojel Village. 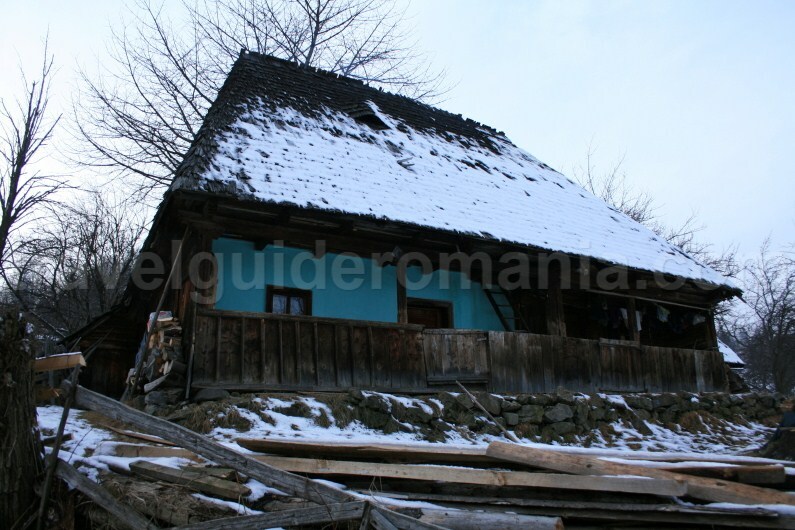 In this area there are many authentic wooden houses and the Romanian traditional customs are still kept. If you come here during the Christmas holiday definitely you will see many people who keep the pigs’ slaughtering custom. Don’t be surprised if someone urge you to drink a glass of brandy, which is the Romanian traditional drink. 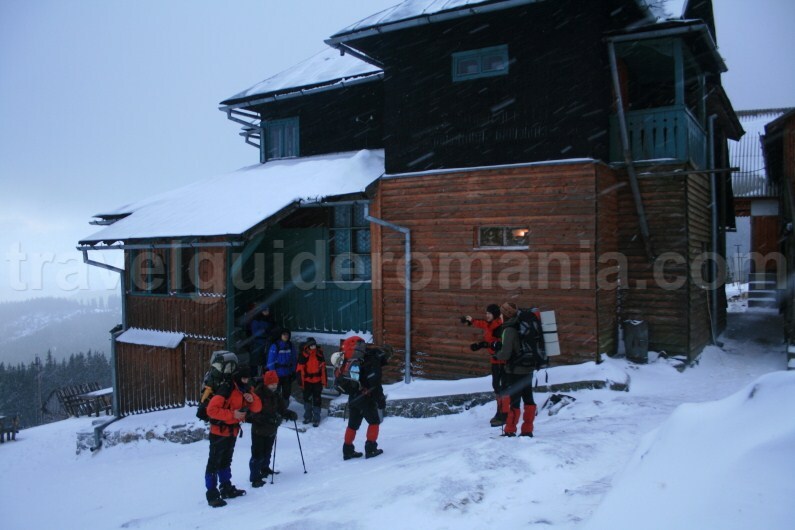 Climbing from the village you can take the first stop to the Vlădeasa Chalet where you could hidrate with a hot tea. Vlădeasa Chalet (altitude 1430m) is placed on the eastern slope of the Vlădeasa Mountains, in the Frânturi(Snatches) Opening. Its capacity is of 32 places in rooms with 3 -17? beds; spring water; buffet on request; cooked meal. Continuing the trail towards the Vlădeasa Peak we climb from the chalet on the red tape mark. We cross by the chairlift’s pillars installed here since 2010. Unfortunately the slope arrangement is not finished yet. We get out in the alpine after about 40 minutes. 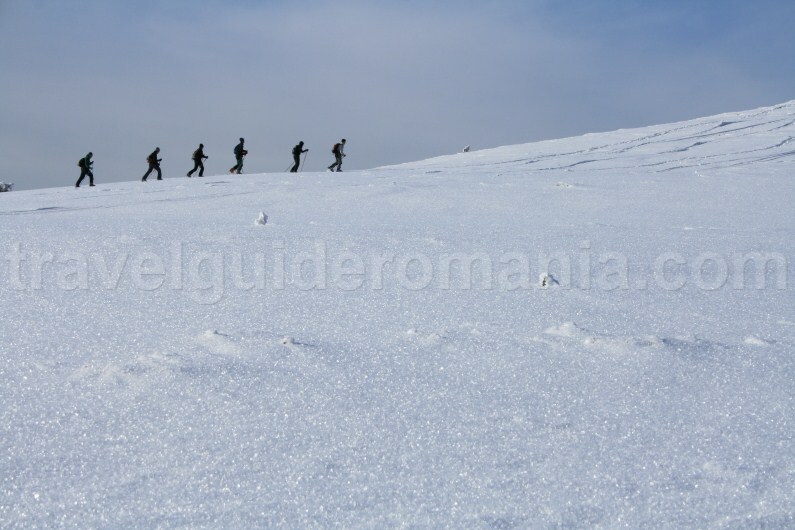 We reach the main ridge of the massif Vlădeasa and turn left in order to get to the Vlădeasa peak. Following the ridge we get into a saddle with the sight above the Vlădeasa Peak. Using the mark signs on the rocks we arrive on the peak 1 hour after leaving from saddle. 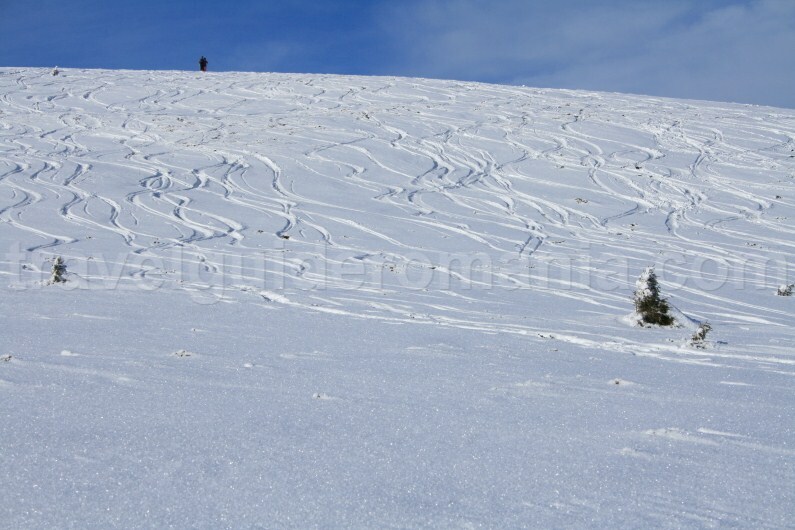 In winter it is not possible to orientate on the ridge using the marks. There are no marked pillars. Mainly you have nowhere get lost, you just have to keep the ridge line. A beautiful view opens wide towards the Henți Valley, Mârgău, Răchițele, Săcuieu villages. When the meteo conditions are favorable clouds sea forms here many times. 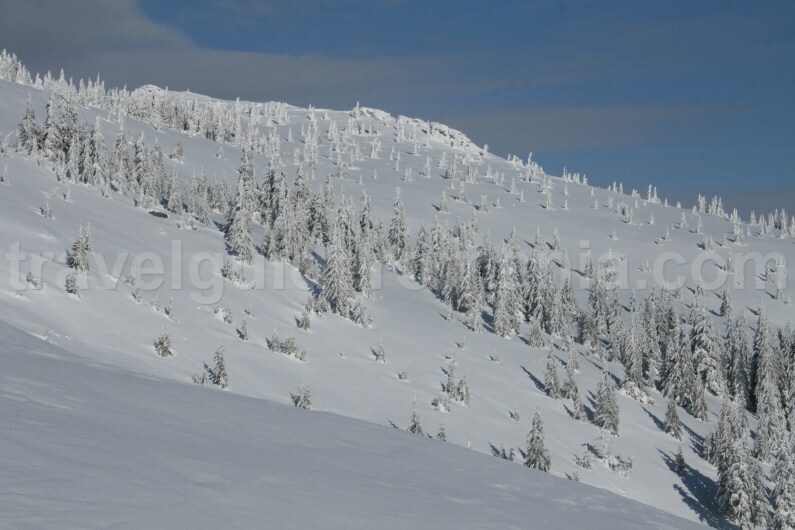 Another aspect specific to the Vlădeasa Mountains are the lonely fir trees from the ridge loaded with snow. Because of the powerful winds the fir threes takes very interesting forms. 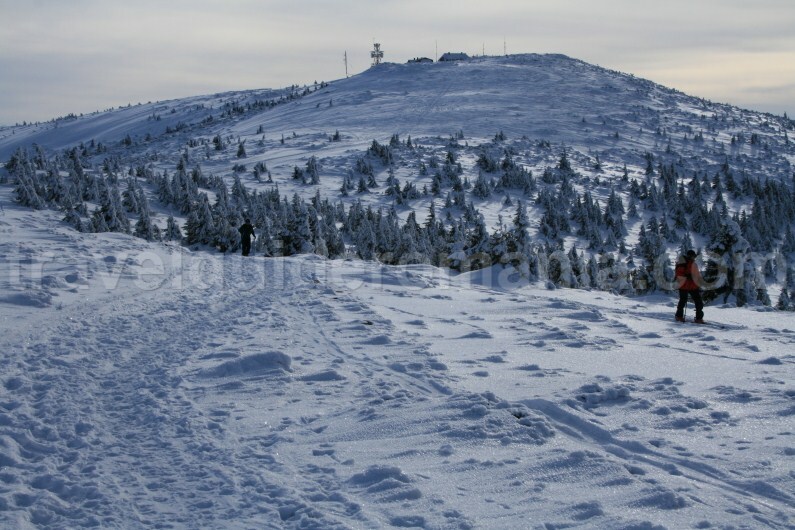 Vlădeasa, with its height of 1835m, is the second peak as altitude of the Apuseni Mountains. 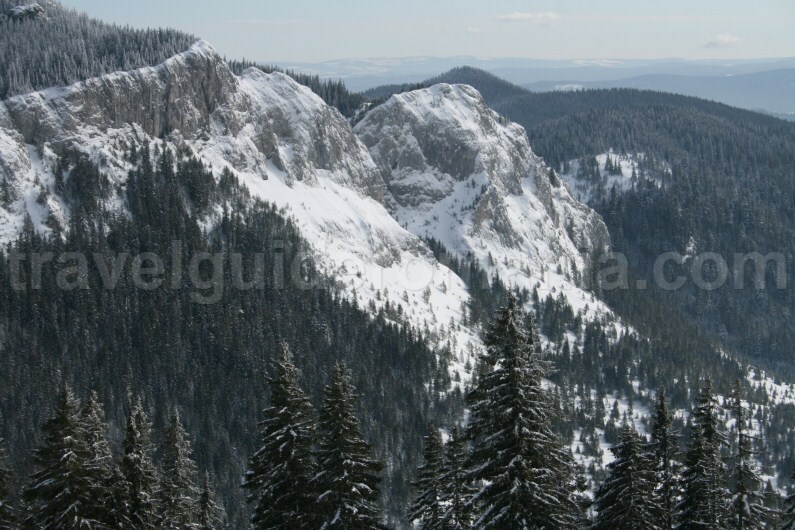 It dominates the surrounding massifs providing sights above the Huedinului hollow (towards east), above the Drăganului Valley and Philanderer Forest(Pădurea Craiului) basin (towards west). Towards the south, the Vlădeasa highlands appear first from which the two Butesa peaks come off. 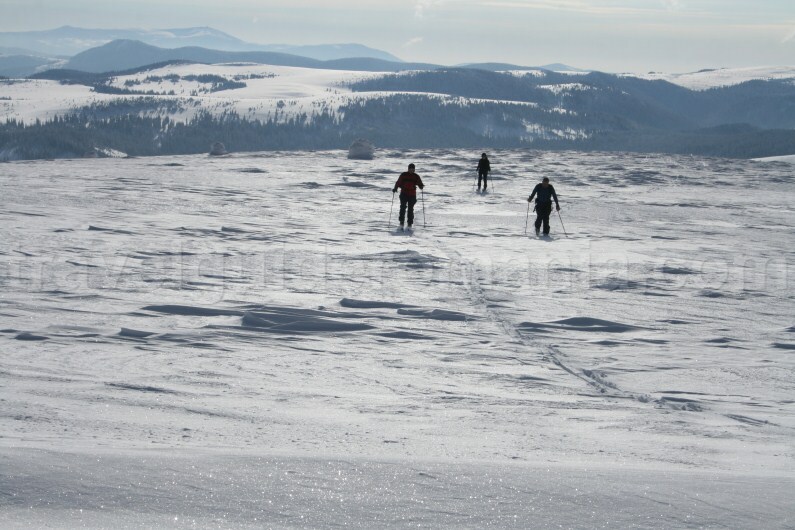 If you have good visibility you can see the Bihor Peak, Retezat Mountains and Rodna Mountains as well. 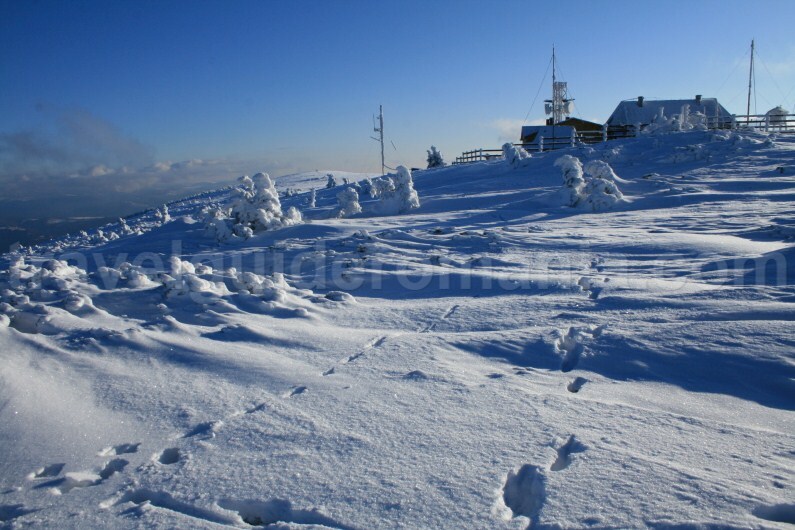 On Vlădeasa peak is the meteorological cottage, shelter place for bad wheater. From the peak, following the quite horizontal edge, we go south and we arrive in saddle with the sight above the Dry Valley (Valea Seacă) and above the impressive steep from the White Stones. 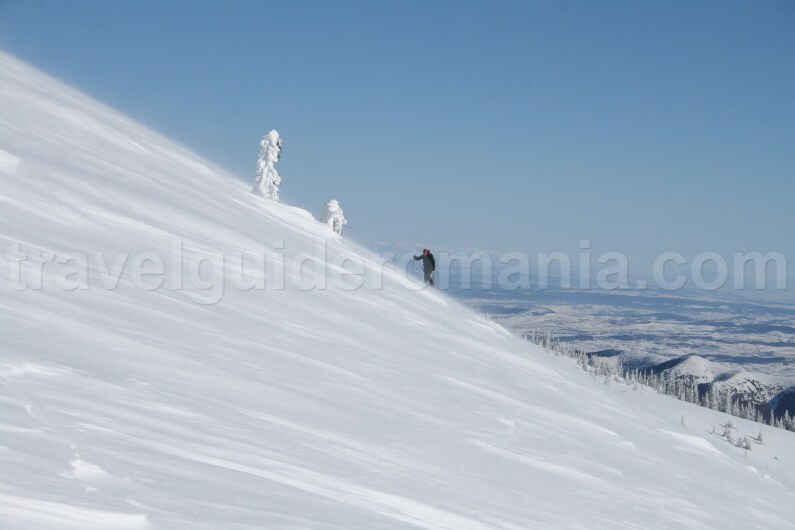 If you are on skies, the slope which descend from the peak area to the White Stones, is one of the best places to ski off-piste from the Apuseni Mountains. 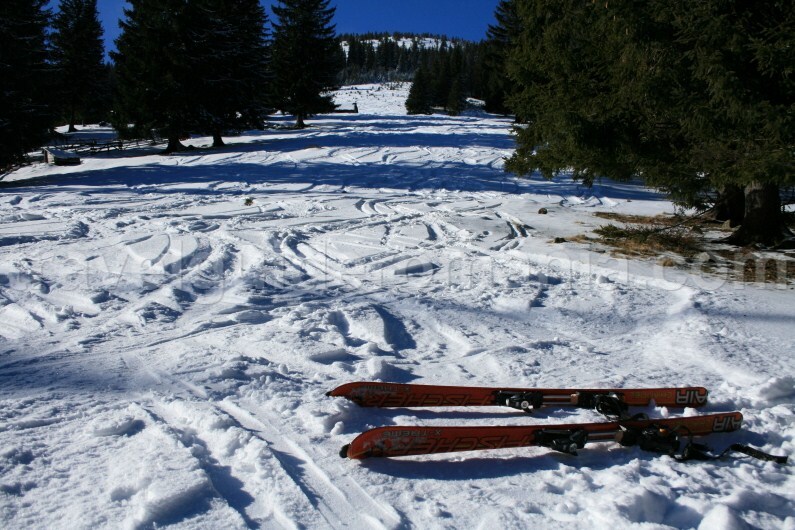 Many people come here for ski touring in this area. The view towards the White Stones from the peak is formidable. If you come here in summer it is better to know that there is an unmarked trail on the superior part of the Stones. 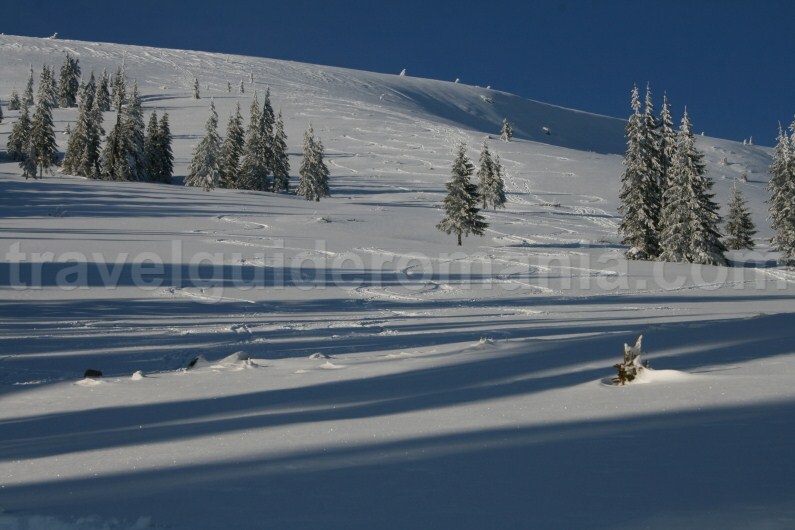 It is one of the most beautiful areas of the Vlădeasa Mountains. 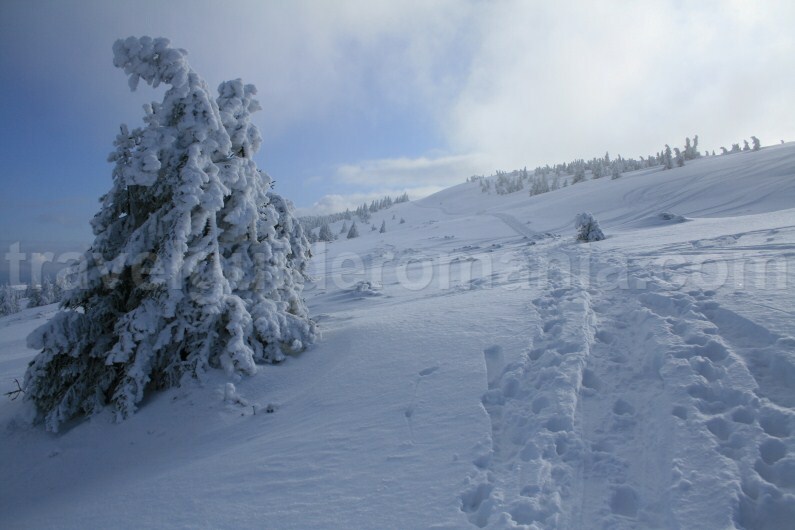 Arriving in front of the White Stones you have two possibilities: you continue the descending towards the Răchițele Valley or you turn around to the Vlădeasa Chalet on the blue tape mark. The last trail goes parralel with the ridge you came on. The trail goes aproximately on the level curve. 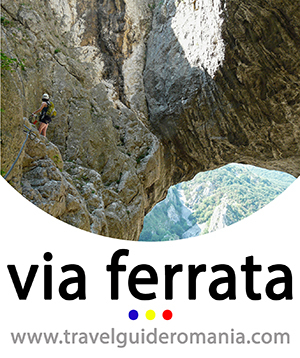 If you want to continue the trip towards the Padiș – Vărășoara area you have this option. The distance could be traversed in a single day. 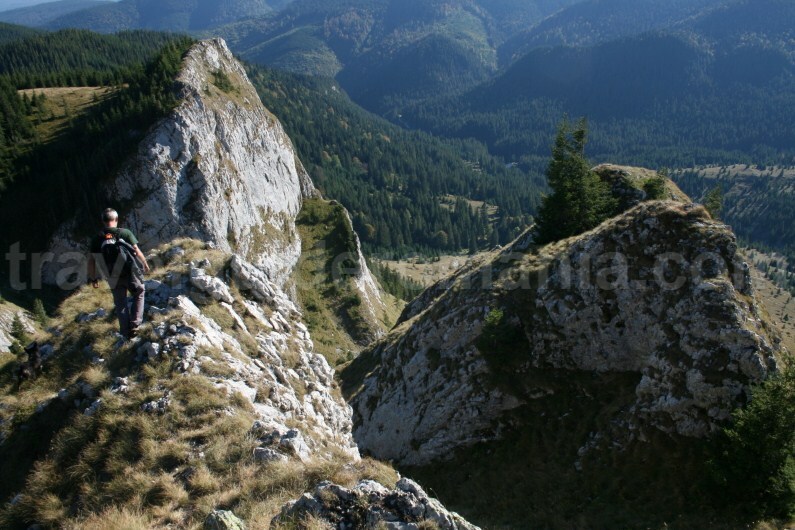 If you continue the descending towards the Răchițele Valley you will have on the left side the White Stones Rocks. We enter the forest and we continue on the forest road. We arrive at the Răchițele Fall. On winter, this waterfall becomes one of the practice places for the ice climbers. Răchițele Falls are found in the estern slope of the Vlădeasa Massif, on the Dry Valley (Valea Seacă), affluent of the Răchițele stream at the altitude of 1000m. The Răchițele Waterfall is formed of two levels altogether presenting a level of differnce of about 30m. 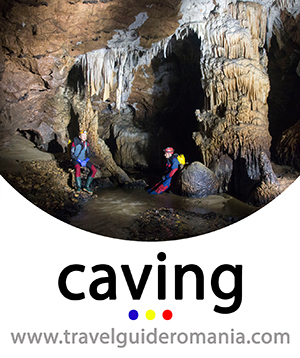 The water digged a deep marmite at the base of the jumping, having the diameter of 10m. 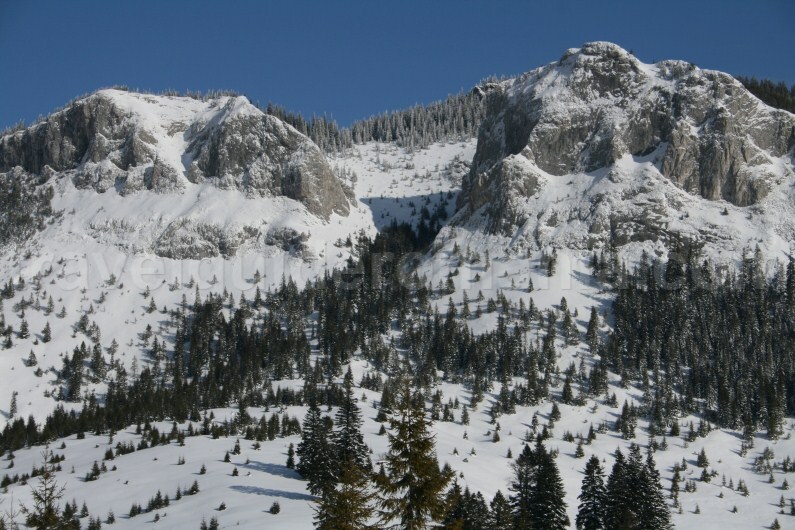 In winter, a wintry festival is organized at the Răchițele Falls – The Ice Walls Festival, also ice climbing trails contest and dry tooling are organized. 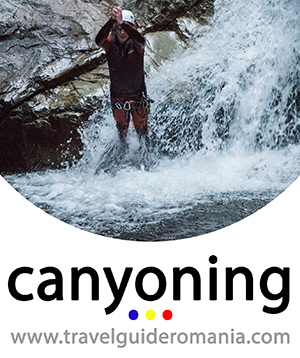 Durring summer here you can make canoying trips. 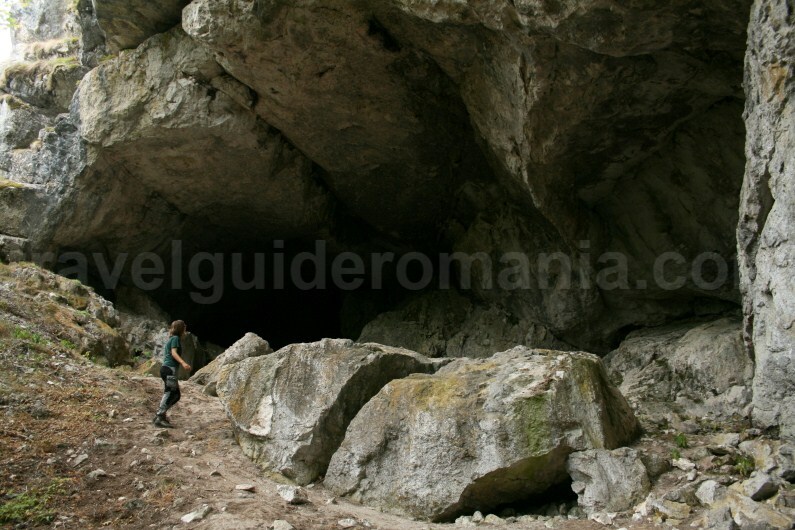 An interesting and unmarked trip trail which worths being done in the area of the Vlădeasa Mountains is Grottoes‘ trip. 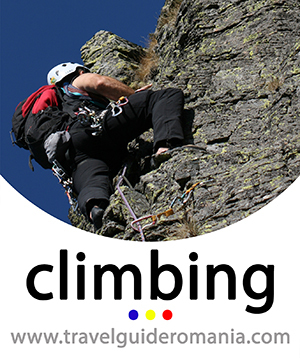 This is a trip with the climbing level 1A and provides many views above the Răchițele Valley in the superior part. 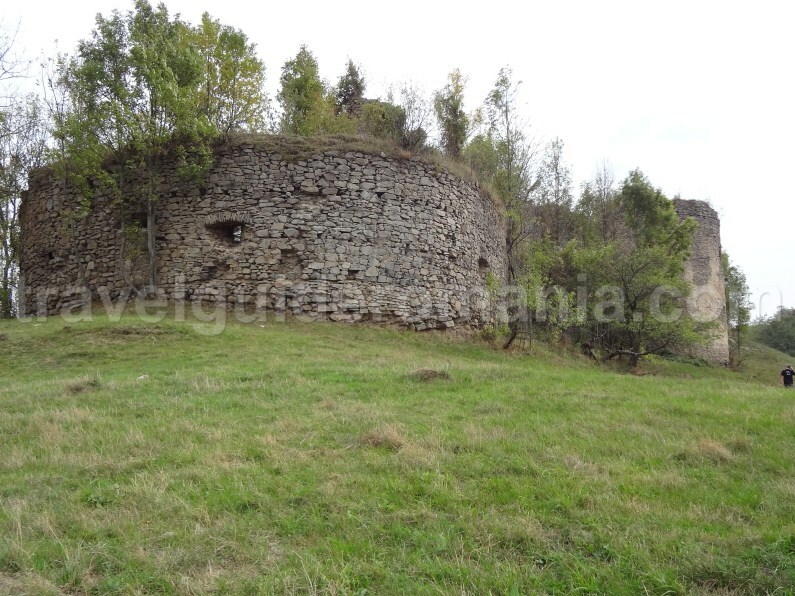 On departure, when passing by the Bologa city don’t hesitate to visit the Bologa Stronghold’s ruins which are found on the Stronghold’s hill.